The Prince of Wales is not liable to pay corporation or capital gains tax, a senior royal aide has told MPs on the Public Accounts Committee. William Nye said the Duchy of Cornwall - which provides the heir to the throne with a private income - was not a corporation and that the prince voluntarily pays income tax. Committee chairwoman and Labour MP Margaret Hodge questioned the "fairness" of the tax arrangements. The duchy estate is worth £762m. The prince was paid £19m from the estate last year and paid just over £4m in income tax and VAT. Mrs Hodge said the committee wanted to "reflect on the current arrangements to see whether or not they reflect the reality of the world today." But the royal aide said the prince's estate does not pay capital gains tax because he "doesn't have access to the capital gains. The capital gains are all reinvested in the duchy for future dukes". Mr Nye told MPs the profits were used to pay for the prince's public duties, as well as those of his wife the Duchess of Cornwall and those of Prince William, the Duchess of Cambridge and Prince Harry. He said that if parliament legislated to prevent Prince Charles using his private income in this way it would cost taxpayers more - to pay for his official duties - and he would be free to spend his money "on his other things". What was a medieval entity... has been transformed into a business. Paula Diggle, a senior Treasury official appearing before the committee, defended the prince's tax arrangements saying that he does not pay capital gains tax because he always reinvests any profit from sales. "If the duke were to be taxed on the corporate income of the duchy as well as his income, he would be taxed twice," she said. She added that the duchy differed to other corporations because the prince "is in the unusual position of getting all the income." The duchy estate of land and property - mostly in the south-west of England - was established by King Edward III in the fourteenth century to provide a private income for his son and heir to the throne. Conservative MPs on the committee defended Clarence House's position that the duchy is in fact a private estate, not liable to certain taxes. "If it looks like a private ducal estate set up to provide an heir to the throne and it quacks like a private ducal estate set up to provide an heir to the throne, can one assume that it might just possibly be a private ducal estate set up to provide an heir to the throne? ", Richard Bacon asked. But Labour MP Austin Michell said: "What was a medieval entity... has been transformed into a business." The last time Prince Charles's representatives came before the Public Accounts Committee they were accused of performing financial "jiggery pokery" and he was said to be the recipient of the "best housing benefit scheme in the world". This time the committee is fresh from finding the tax affairs of Google, Starbucks and Amazon wanting. Graham Smith, chief executive of the anti-monarchy group, Republic, said: "Everyone has a moral obligation to pay a fair rate of tax, whether that's Starbucks, Google or the heir to the throne. "We welcome the PAC investigation and hope that this exposure of the duchy's tax arrangements will force the government to act." Earlier this month, the prince faced calls from Andrew George, the Liberal Democrat MP for West Cornwall, to "come clean" about the Duchy of Cornwall's tax arrangements. 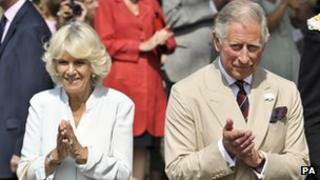 Clarence House has said public funding for the Prince of Wales fell by £1m to £1.2m in the last financial year, out of a total income of £20.2m.